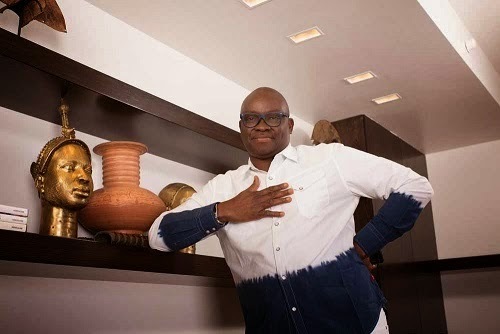 Shortly after he was sworn in as Ekiti State Governor last month, Ayo Fayose ordered the closure of a petrol station in the state capital, Ado-Ekiti, giving a standard made-in-Nigeria excuse. That filing station belongs to one Adewale Omirin. Omirin also happens to be the Speaker of Ekiti State House of Assembly and one of the progressives in the state. Last weekend, Omirin retaliated by promising Fayose a second dose of impeachment before Valentine’s Day, 2015. Clearly, these two are not lovers. But the Federal Government and Fayose moved in first. Twenty four hours later, Omirin was “impeached” by seven House members while a battalion of heavily armed federal police stood watching. I guess when the Peoples Democratic Party promised Ekiti voters more federal presence in their state, they weren’t kidding. A few days before that, the judge presiding over a lawsuit looking into Fayose’s eligibility to contest the governorship election removed himself from the case. His reason? He got a couple of death threats. Ekiti seems determined to keep itself in the news – bad news. Fayose’s second coming was always going to play out like this. If you are a dealer in boxing gloves, I’d suggest you relocate your business to Ado Ekiti. There’s no doubt that Ekiti is suffused with redoubtable men and women. But an Ayo Fayose is their governor, for the second time. You could see why there would be tension. But because of that tension, some folk down there are giving the word “Progressive” a bad meaning. The first time Fayose called the shots in Ekiti, the place was in a mess, the state became an object of ridicule. But his people wanted him back. He was, surprisingly, their choice as leader. Well, the people’s choice must be respected always. This is one bitter pill, one fact with which the elite and the progressives have got to come to terms – and quickly too. Fronting for the progressives in Ekiti at the moment is a group that christened itself, E11. Immediately after Fayose’s victory in June, the E11 rushed off to the press and issued a congratulatory message, pledging to work with Fayose for the progress of the state. Then, something funny happened. A few days later, the same E11 recanted. It declared that it will not accept Fayose as governor. It was the same with the All Progressives Congress. Following his defeat, ex-Governor Kayode Fayemi who led that party in Ekiti promptly announced that he accepted the people’s verdict. Fayemi was rightly hailed as a true democrat and a progressive. However, a few days afterwards, his party declared that the result of the election was unacceptable and headed for court. All of that, in my view, is sour grapes, and in fact, makes all these folk look bad. The APC might feel that it is doing what an opposition party is supposed to do after an electoral loss, but at some point, political parties in Nigeria have to recognise a defeat as just that, congratulate the winner and move on to prepare for other opportunities. I understand that the E11 has been in court challenging Fayose’s eligibility to contest, prior to the election. If this was the case, then it was very strange for the same group to congratulate Fayose publicly via a press statement, only to return to court pushing its case. The whole thing is a joke, and if this is how the “progressives” practise their trade in Ekiti, you can see why Fayose had an easy victory there. The Ekiti people have spoken and have (overwhelmingly) made their choice. That’s democracy – warts and all. When Fayose drops the ball again (and he will), the same people have the choice and the mechanism to reject him. The current manoeuvrings by the progressives come dangerously close to attempting to override the people’s mandate, and it makes Fayose look like a combative saint. In other words, it stinks and it’s clumsy. All their exertions now look like class warfare. For all we know, the kerfuffle in the state could be from Fayose’s camp or could be emanating from a disgusted and frustrated citizenry who sees what appears like an elite judicial coup against them. Heck, I would be upset too! Oh, there is nothing wrong with a group of sufficiently concerned citizens coming together, wanting to do something about what they perceive to be an anomalous situation in their community. Fayose should have been stopped before the election. But once the people have spoken, that should be it. A small elite group cannot take it upon itself to overrun and overturn the people’s mandate. Today, there is one recluse in Minna called Babangida who with all the military might at his disposal tried to do the same thing back in 1993 but he was resisted. The gentleman was forced to step aside and he never recovered politically. I don’t think Fayose is going to change in style or in substance. You heard his inauguration tirade. We already had a preview of what is to come. If Fayose stays true to type, he will be a disaster. But he will be the people’s disaster as chosen by them and that choice has got to be respected, I’m afraid. Even old governor Pilate could not overrule the people when they asked for freedom for Barabbas rather than for Jesus. Again, that’s democracy – warts and all. So, please, enough of the inelegant hide and seek. Let the progressives leave the people alone to enjoy or to suffer their choice. Let Fayose and Ekiti, the stomach infrastructure state, now get on with it. Speaking of which, I cannot wait to meet that person who would introduce himself or herself as the Special Adviser on Stomach Infrastructure, or hand out a business card with that title on it.